PANJIM: Clube Sao Miguel de Taleigao registered a fluent 2-0 win over Goa Velha Sports Club, while Dunes Sports Club managed to remain unbeaten in the Geno-Goa Football Association 1st Division League following their 1-1 draw against Curtorim Gymkhana on Saturday. 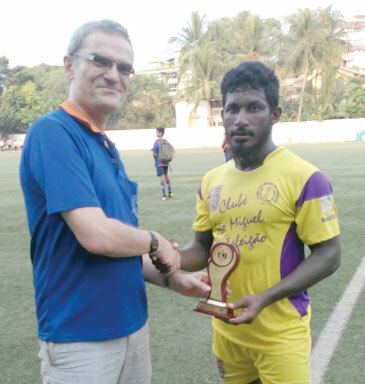 At Duler Stadium, Mapusa, CSM Taleigao scored a goal each in the either half of the play to collect full points and inflict yet another defeat upon Goa Velha Sports Club. After end to end football in the initial stages of the game, CSM Taleigao surged ahead at the half hour mark through Newton Azavedo when Goa Velha defender misjudged a long ball played by Bavesh Shirvoikar and Newton made the best use of the pass as he covered some ground and placed the ball past the helpless keeper. Irfan twice missed open goal scoring chances before Taleigao doubled the tally in the 81st minute through F Correia who was also fed by Bavesh Shirvoikar. The winger played a cross from the right flank which was guided in the goal by Correia. In another match at Poriat ground, Albert Britto scored a 90th minute goal to give Dunes their fifth successive draw in the league as they held Curtorim Gymkhana 1-1. Curtorim took the lead in the 18th minute through Desmond Pereira in the first half. In the second half, there was plenty of action but neither sides were able to score. But when it looked like Curtorim would walk away with another win, Albert Britto came with the equalising goal for Dunes and was rightly named as the man-of-the-match.